I glued a couple magnets onto a wooden dowel with a screw through it to make a permanent magnet rotor. The magnets aren't particularly strong, and my first attempt had the poles opposite one another: that is, the north on one magnet mated with the south on the other, so the field was even weaker. (This all fit into the field coil from the Dirt Devil motor.) At 3,100 rpm, I could output 53 Hz AC at 2.7 volts open, 2.1 volts into 51 ohms (0.086 watts) and 0.7 volts into 3 ohms (0.16 watts). While this isn't particularly promising, I purchased a pack of 50 0.25" diameter neodymium rare-earth magnets from K&J Magnetics. They're supposedly rated at N45 which I guess is almost as strong as you can get. I took a bit of a hiatus from the bike project to do something else but I finally got back to it. It took a little while to get my head around it again, but I quickly got going. The right side of the rear frame. Pieces of threaded pipe will let me take the frame apart. I got the diagonal supports that tie the steering tube to the midpoint on the seat back. My calculations were off somewhere and the support is higher on the seat back than I had expected so I'll need to make some adjustments: I had originally designed the line of the support to pass through the seat back and cross the bottom of the seat but now it won't. I got on the LSDiodes.com website and found the full-spectrum LED's were out of stock; it turns out they won't be available for around a month. I decided to get 3mm red/blue LED's and 3mm green LED's instead — the voltages are a little different, but overall they are much brighter (almost 3x) than the full-spectrum LED's. 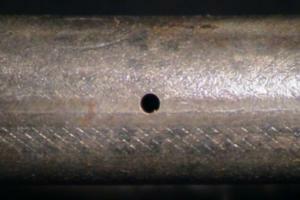 I found a fence gate in the trash the other day and the tubing has the same inside diameter as a bicycle steering tube. 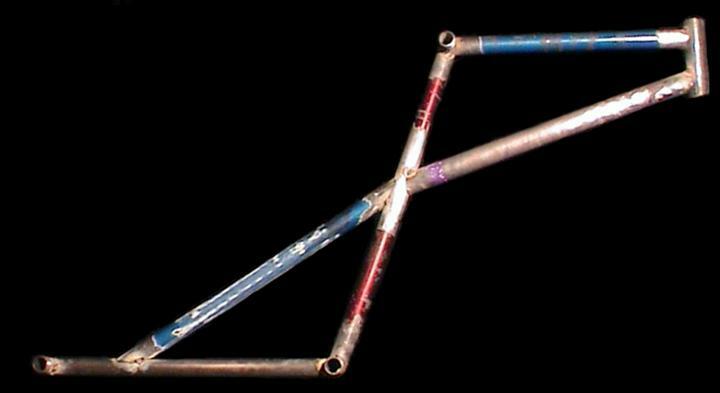 I cut a couple pieces and tack-welded the top rear tube to the steering tube at a right angle. I'm using a grinder to create the rounded seams — sometimes I do a really good job and others will need some fill material. For the right angles, I've got magnetic holders to square them up. 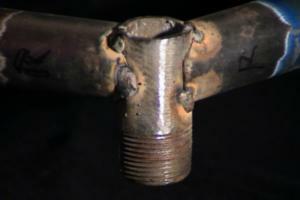 On the other end of the top tube, I welded a short length of 3/4" schedule-style threaded pipe. This way I can thread together the frame as needed. The The University of Rochester Medical Center (601 Elmwood Ave.) is just down the street from my house, and they just recently closed their surplus sale site to demolish the building sometime in the future. During cleanup, they had thrown out the bed frames that rotate — I don't know what they're called, but they've got big steel hoops on each side. They had cut them up, but I snagged two pieces that I hope to use for the top of the vehicle frame. They were 72 inches across and 25 inches high &mdash approximately half of one of the hoops. I put representations in the CAD drawing and they're arcs from an 80-inch diameter circle. I'll need to bend them tighter than they are currently, but at least it's a start and will save me the trouble of starting from scratch with straight tubing. I chopped up 4 bike frames and now have enough pieces of adequate length to make both sides of the rear end. 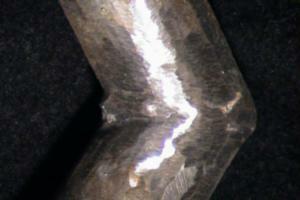 With enough grinding, any weld can look good. At least I remembered to drill vent holes. I found that I had some problems in the back end. First, the tubing I expected to use was longer than any bike tubes I had, so I made them all shorter. However, I had drawn the wheels castering backwards: if the wheel were to spin 180 degrees from where I had drawn it, it would strike the frame. The forks I have vary but the axle was typically 2"-2.5" from center — I had estimated 3 inches in my original drawing. I also measured the distance from the bottom of the steering bracket to the top of the wheel, and that's about 4 inches, but I had only given 1 inch in the original drawing so I increased it and adjusted the other parts. In the process, I added some more support. I worked on the bike frames and cut enough pieces to make one side of the rear of the frame. I wasn't going to have enough time before sunset to finish the frame, but I did get out and weld the eyes together. 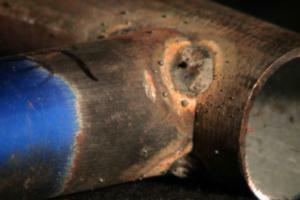 There were a few strokes of the welder that went really well, and as I went, I improved. I had to grind a lot of material away to get it to a reasonably attractive shape, but it otherwise looks pretty good. I figure I can easily convert a DC motor to an AC motor by tying one side of the rotor windings to both sides of the brush assembly rotor thing, and the other side to the shaft. That way I can step up the output voltage to a useable level. I went to the basement and grabbed all the motors. I decided to try converting the drill motor since it generated the highest current (next to the original) and it's the largest. I decided against the air pump motor because, although it can source a lot of current, the output voltage is so low it's almost not worth it … then again, that's based on running it up to 3,100 RPM on the drill press, not the huge speeds from spinning on the rubber wheel. Anyway, I took apart the gold-colored motor and rewired it. I started by cutting a groove around the commutator and soldering the original poles together so I ended up with a 2-pole slip-ring instead of a 3-pole commutator. I ground down the brushes so each would contact one pole of the slip-ring. I disconnected the three poles, undid the connection that tied the windings in a loop and connected each end to the slip-ring contacts. When I reassembled it and tested it, I roughly zero volts out. I had successfully demonstrated that the motor was wired efficiently and Kirchoff's laws still apply: of course there was no current flowing at that point — otherwise, when run as a motor, it would short-out. Dummy. I took it apart again and wired it for 3-phase. Two phases were wired to the brush output, and the third was soldered to the shaft bushing so I could use the case as the third phase. It sort-of worked, but then the wire I was using to tie the third leg to the shaft came loose and wedged between the rotor and the magnets. I reassembled the motor with a stiffer wire. I found that the brushes would bounce on the imperfect rings I had so they wouldn't transfer the power. I could get up to about 1 amp of output on any one coil and up to 1.5 volts or so. I cleaned up the rings and such but couldn't get them round enough with the tools I had so I gave up on it. However, I also had an AC brush motor from a Dirt Devil hand-held vacuum and figured I could make a rotor with permanent magnets to induce current in the outer coil. Finally a break in all this: the rotor shaft was 5/8" which is the same size (well, 8mm) as the the bearings I bought for the Savonius rotor. Even better, the magnets in the gold-colored permanent magnet motor are very close to the right size. I tested some of the motors at high-speed to see how much they'd generate and to see if any would be suitable. Note that the motor speed was dictated by the shaft diameter; the drill motor, 6V motor, and original motor had larger shafts and ran slower. For the stepper motor, at 1,100 rpm, using both phases through a bridge rectifier, it would source 0.63V into 3 ohms or 0.13 watts. One phase through a 5:1 step-up transformer frustratingly yielded the same results: 0.6V. Both phases in series yielded 0.67 volts, and at 1,720 RPM, 0.8 volts. 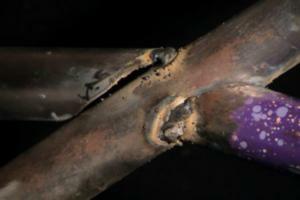 The open voltage on the transformer secondary was 11.75 volts. I also took apart one of the pumps that I used to use for the air horns in the car and got its motor separated. It could source 3 volts into 3 ohms and had a short-circuit current of 5 amps at 3,100 RPM.